The variable types supported by the PGM are shown below. See also Variable declaration. Variable names must be alphanumeric and uniquely declared within their current scope. A variable name can not include a '.' (dot) as part of the name. The PGM language, including variable naming, is NOT case sensitive. Only variables of type Double or Real can have a value of NAN (Not a Number) shown as a '*' on the Access window. Use IsNAN function to test for NAN. When a value or variable is assigned to another variable, it is ranged within the new variable type's range, as illustrated in the examples below. z = 1035    ;z = 255         maximum value of Byte type is 255.
z = -2.3    ;z = 0           minimum value of Byte type is 0.
w = 335.4   ;w = 335         INTEGER type are integers only. z = w       ;z = 255         limited by the maximum value of byte type. The Const keyword ensures that the value assigned to the variable will remain unchanged (i.e. it becomes a read only variable). See also Predefined Constants and Variables. Const real LiquidHTC  = 1.5    ;Numbers cannot be written as a fraction. Const String Condition1 = "Mass balanced"
Const String Condition2 = "Mass NOT balanced"
A Constant variable cannot be declared in a Class. A Constant variable cannot be displayed in the Access window. In SysCAD 9.3, a Constant variable cannot be a calculation, this includes using numbers in fractions. So while const Real LiquidHTC = 1.5 will work, LiquidHTC = 3/2 will report an error. The user can add a check box to the access window by declaring the variable as type Checkbox. The check box is a toggle between true(1) and false(0). The user may declare a number of integer constants using the Enum command. (Enum is derived from Enumerate) This gives the user a convenient method of declaring a group of integer constants. The Enum functionality is only available in SysCAD 9.3. The user cannot display the Enum constants in the Access window. The declaration cannot occur within a class, but the constants can be used within a class. Counting is automatic, starting at 0 and incrementing by 1. However, the user may override the automatic values and assign their own values to the variables. The user may also declare a single variable of type Enum. This is equivalent to declaring the variable as type long or integer. The EnumDropList variable type is only available in SysCAD 9.3. The initial (default) value of the variable is the first item in the list. In the above example OperatingMode will initially be 2 (Acid). If the variable is set to a value which doesn't match one of the defined options, SysCAD will choose the option which is numerically the closest. In the above example, if OperatingMode is set to 3, SysCAD will reset its value to 2 (Acid). Each item in the EnumDropList has an integer value. If the user does not set a value, then counting is automatic, starting at 0 and incrementing by 1. However, the user may override the automatic values and assign their own values to the variables, as shown in the above example. In this case, if a variable is NOT assigned a value, then it's value is incremented by 1 from the previous variable. The definition of the drop list (using EnumDropList) cannot occur within a class, but once defined, it can be used for variables declared within a class. The Drop Down List variable type is only available in SysCAD 9.3. Each item shown in the Drop Down List has an integer value starting at 0 and incrementing. 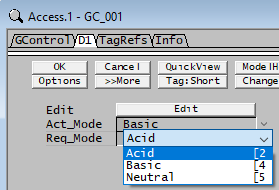 In the image above, if the user selects 'Acid', then OperatingMode = 0, if 'Basic' is selected, then OperatingMode = 1 and similarly if 'Neutral' is selected, then OperatingMode = 2. The initial (default) value of the variable is 0, corresponding to Acid, the first item in the list. If the variable is set to a value which doesn't match one of the defined options, SysCAD will choose the option which is numerically the closest. In the above example, if OperatingMode is set to 4, SysCAD will reset its value to 2 (Neutral). Please note that 'Acid' is NOT = 0. If the user requires the variables to have a constant integer value, then they must use the declaration 'EnumDropList' shown above. The definition of the drop list (using DropList) cannot occur within a class, but once defined, it can be used for variables declared within a class. This page was last edited on 5 November 2017, at 23:05.